The MYDO Baitswimmer # 3 Couta Trace with a Stainless Steel Bill Plate, custom designed for the #3, adding action, depth and flash. The next size up features a pulling eye and is available rigged and ready! This version scores a Billplate for added action, flash and depth. It is suited to smaller baits around 15cm, but will swim a 30cm shad or bonito, no problem. Rigged light the #3 is great for reef fishing for gamefish, and your perfect medium bait(red-eye sardine, mackerel, sardine, shad) can be trolled surprisingly fast – the faster you pull it, the better the action! It is when you troll at these higher speeds that makes the yellowfin tuna all excited and they readily take a fast trolled Mydo bait. Choose your # 3 MYDO Baitswimmer rigged light with #5 Wire Leader and #7 to the twin trebles 5X # 2’s, or heavier option using # 7 trace to hooks # 8 and bigger trebles, the # 1 5X. Power! 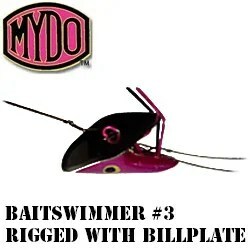 Note: this Mydo is also especially suited to light tackle. It weighs 2oz but it’s oversize pulling face puts you in total depth control. The beauty of the MYDO Baitswimmer Couta Trace is in it’s application for just about any fish in the water. Trolled slowly they work great for couta and dorado – and up the ante and get billfish and tuna interested too. Use a firm fresh bait – some baits work better gutted and sewn up again.